Went to the movies with my eldest child (child. How long can I write that and not misrepresent her, born in 1999 that she is, and thus, have come of age in so many ways the word child doesn’t really fit the bill any more. She is my child, and always will be, though. Interesting conundrum this! ), my cousin and her husband. 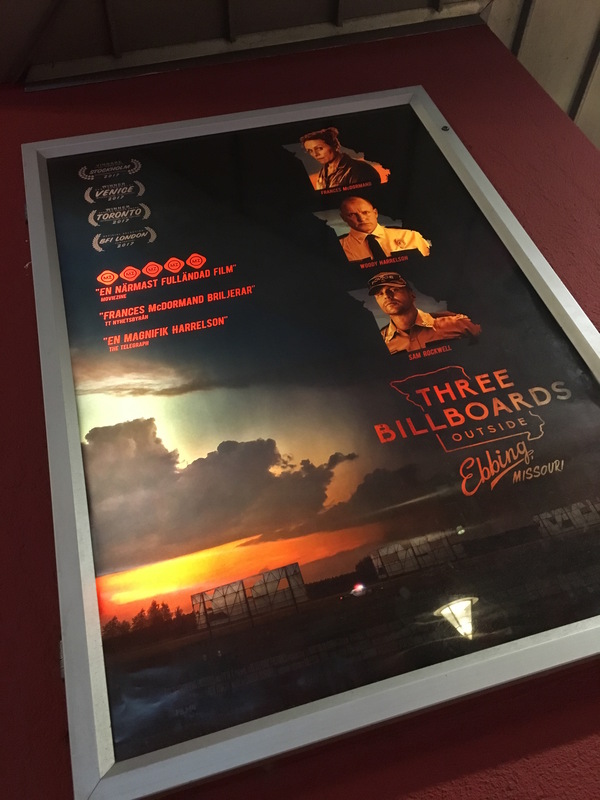 We saw Three billboards outside Ebbings, Missouri, a movie I’d watched a short trailer of, and immediately decided it was one I wanted to watch. And the acting. Holy moly, Frances McDormand and Sam Rockwell. Worth watching simply for the world-class acting. This is a movie that gripped me. Far from a feelgood-movie, it rather left me with a lingering feeling of… the complexity of humans? That there’s light and darkness in us all – this movie certainly let me utilize my ability to see both sides in each individual character. Ample evidence of how self-destructive negativity, hatred, violence and distrust is. And as much evidence to the contrary; one of the most moving scenes has one man pouring and offering a glass of orange juice to another man, both admitted to the hospital. Heartbreaking vulnerability, from both men. Gripped I am, and as I sit here, a few weeks after watching it – that lingering feeling remains. Value for money!